Following the training program planned for 2017, the “ABACC- IAEA Course for Joint Auditing of Registers” was offered to ABACC inspectors. The course took place from 18 to 21 April and 10 Argentine inspectors participated. 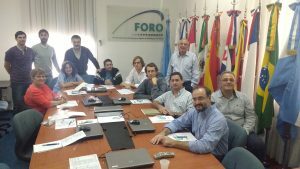 The objective of the course is to keep the inspectors updated with the activities performed during the inspections in the Argentine and Brazilian installations under safeguards.